Travertine mantel surround Olivia has turned out legs and inner slips that meet the fire box. 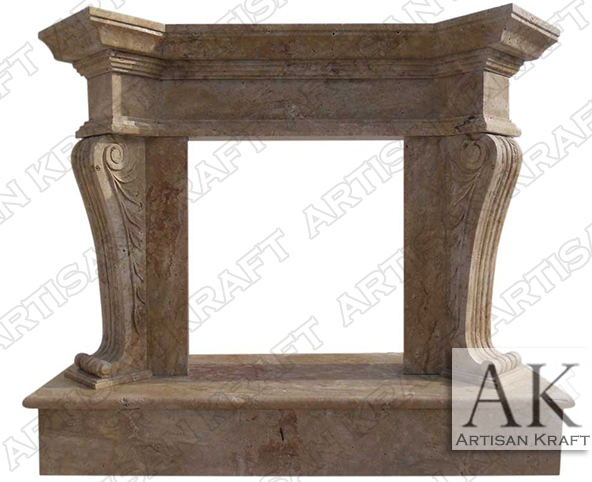 The shelf sits a top the two “S” scroll fluted corbel surround legs. There are simple yet perfectly placed olive branches carved into the sides. There are a variety of travertines to choose from as well as a other natural stones. A variant of the Olivia can be made from GFRC. Olivia is part of our Antique Fireplace Collection. Typical Dimensions:72″ wide x 52″ high *can be made to custom dimensions. Stone: Precast, marble, limestone, sandstone. Available in many different colors and finishes.